Handle the heat of a steaming hot grill or griddle with this Mercer Culinary M33183 Hell's Handle high heat 6" x 3" slotted fish /egg turner. The heat-resistant handle can withstand up to 450 degrees Fahrenheit. It also absorbs 50% less heat than a standard polypropylene handle, remaining cool to the touch even in the hottest conditions. Plus, this tool has a 45-50% higher melting point than traditional handles, ensuring that it will remain durable long beyond the competitors' models. Perfect for commercial use, the dimpled handle features a dual-textured finish for extra grip, slip resistance, and comfortable use! The handle is also completely sealed for excellent sanitation. Bought this for hash browns, pancakes, omlettes, and various other egg dishes. The Hell's Handle pieces are REALLY extremely well-made. The steel is extremely sturdy and high quality. The handles are made of this magical plastic that doesn't have a meltdown every time it looks at the stove! Also works to whisk everything up for batter or eggs, which is a miracle tool! It's not flexible though, so don't think it will bend like a wire whisk. This is certainly useful in its own right. We are being converted to Mercer. Used to have all Cutco and Dexter but Mercer is a dang fine quality knife! This is one of 3 products we now have from Mercer. This is your industry-standard fish spatula. It's strong, flexible, BUT it's right handed. It's not un-usable for a lefty, but the angle of the edge certainly makes it more comfortable for a righty. I would recommend this spatula. This is the best spatula I have ever used! The thin edge on it allows me to work easily with delicate dishes such as eggs and fish. I will never buy any other type of spatula. Buy this, you will not regret it at all! This is my most used spatula in the restaurant. I love this thing. We are a seafood restaurant so we are always pan frying fish and this one does the best job. I also have the plastic high temp slotted turner but this item is much better. Nice item for the price! The metal part is a little soft (not extremely sturdy), but still a great item! The thin corners gets under surfaces easily. We had to switch to an all-plastic option, as the metal was scratching our appliances. This spatula is amazing it making flipping eggs great! I also love how it could be used for any type of fish its also very sturdy! This turner/spatula has quickly become a favorite in this household. The handle NOT melting or burning is a great addition. Also, keeps cool and you have no fear of burns from a hot handle. I love the slanted style. Might consider making RIGHT and LEFT. My go to turner! For me it has the perfect amount of flex. The the sharp front edge is really great for slipping under anything and even kind of scraping under something that is stuck. The handle is comfortable and definitely handles the heat well. I have not left it on the edge of a hot pan for more than 30 seconds or so, but it can handle that no problem. I can't emphasize enough how good this spatula feels in my hand. Online, it looks a dinky, but when I received my order, I was pleased to find that this spatula is a solid and formidable piece of kitchen equipment. The handle feels like solid molded plastic and the shape is perfect. Does what it should, and does it well. Great high heat fish turner. Have uses these on the line for grilled salmon and more. There's a lot of turners out there but the high heat handle is what makes this a winner. I don't know how I got by without this product before. I think it's impossible to break and egg with it and no longer does any salmon fall apart. Totally a life saver in the kitchen. What can I say? These are the go to spatulas for pretty much everything in the kitchen. The steel is strong and springy and the tapered edge helps to slide under delicate edges easily. I would recommend this for anyone. When I first started to learn how to cook, i had a very hard time being able to make eggs over easy. My eggs always broke once I turned them over. I tried several different spatulas but none of them surpassed the quality and reliability of this spatula. I purchased the Mercer M33183 Hell's Handle High Heat 6" x 3" Fish / Egg Turner / Spatula (Item #: 470M33183 MFR #: M33183) to use in culinary school. I love this spatula. It's flexible but stiff enough to handle turning delicate items like fish and eggs. This is the shorter spatula but I'm happy with it. I will purchase the longer one eventually to handle larger pieces of fish (like salmon). It's a piece someone always wanted to borrow when I brought it out in culinary school. Great tool, excellent quality. I don't think i could live without this spatula. My choice of eggs is over easy and this tool makes turning eggs a breeze. One of my must haves. The blade of this fish spatula is somewhat stiffer than some others that I've used, which I like, in that I can lift heavier items without fear of dropping them. If you're looking for a super thin, flexible spatula, this may not be for you, but it meets my needs perfectly. I've used this in the kitchen and outdoors at the grill, and it's great. Feels very solid and is easy to clean. Highly recommended. Awesome quality at very reasonable price. I had been paying 50% more for mine. I keep having family steal these from my house as they are such handy turners. This is a great item. Heavy duty, good price. Easy to clean. Great for fish, cookies and. Stuff like that. A most have ! ! This is the right tool for any fishy job, Ergonomically designed to fit well in the hand, and even after a full shift this spatula is easy to clean. We initially bought this to handle fish, but have been surprised by how much we use it for other applications as well. It is extremely well built and the perfect size for a variety of applications. The wood "Hell's Handle" is great and provides a lot of comfort when using the spatula. It is a bit on the small size and a bit thinner than the one I already have. I bought this for my daughter as a gift. I hope she likes it, but if not, I'll buy her one that's a bit larger and more substantial. it will work for fish and smaller foods, but I don't think it will multi-task as well as mine. Awesome egg/fish turner! I mostly use it for fish and it's been fantastic. Easy to use, easy to clean, easy to store. Can't really complain. Love it! I love these spatulas! Whenever I move to a new restaurant I make sure we have at least one of these in house. They're the best for turning fish, and anything fragile. Very happy with this spatula. I primarily use it for fish and scallops and it works great. Lightweight but very strong and easy to clean. I use this spatula on a daily basis for many different things. It is great for making eggs or flipping fish in a pan. A must have for any kitchen. Great for fish and eggs just like the title says. It's also great for cookies and a multiple of other items. This might be the most used item in our kitchen. It's light and maneuverable in the hand. The metal blade is thin enough to get under things easily but still strong enough to support a heavy grilled cheese. I haven't tried leaving the handle leaning on the edge of a hot pan so I can't comment on its heat resistance. High quality. This spatula is great for turning burgers on the grill. I like the slits and the fact it feels so much stronger than the plastic ones. Haven't melted the handle yet witch it what I always seem to do to cheaper models. A great all around spatula. The fact it can handle high heat means it will fit well in kitchen applications. The slotting helps when removing items that are cooked in a liquid. This is the turner of champions. It feels agile in the hand and has the right proportions and flexibility to manipulate food well. I thought cooking eggs in a stainless steel frying pan was a fool's errand until I tried this spatula, It is so adept at getting under food that any stuck food will lift right up with it, even eggs. Another feature that I enjoy very much is this: if you place the turner flat on the counter, the plastic handle portion is heavier than the stainless end, so it will naturally rest without the steel touching the counter. This means you don't need a spoon rest to avoid making a mess. Great for flipping and cooking fish. We use these for all of our sautee stations and recommend them highly. Durable as well. Great product all around. This is a nice turner that I use for eggs, hamburgers, bacon, frying ground meats, even sauteing vegetables. I find it much easier than using a spoon. This is one of my favorite tools. Fantastic! It's sturdy and just flexible enough to do its job but also many others. The handle is really heat resistant, and it's a good size too. Simple grill tool. Lightweight. This spatula makes cooking easier for the any kind of chef. Especially with those tricky dishes like fish and eggs. Easy to clean. I LOVE This spatula. I have relied on this spatula in professional kitchens as well as my home kitchen. It's my go to turner and I use it with any chance I get. This turner is both delicate and tough. You can put pressure on it to get under tight corners and it springs back fine. It also handles delicate tasks with its thin profile and curves. The high heat handle claim is no joke. One of my cooks left it on the edge of a cast iron skillet over a high flame. I expected the turner to be ruined; melted or at least deeply grooved from the skillet rim. But it merely bubbled a little and we still use it. This turner is perfect for eggs and delicate work, its handle is heat resistant and it feels like it will last forever. Definitely recommend it! Got this item a month ago. Since we do sell quite a bit of chargrilled and broiled seafood, this item is a must and does the job very well. The quality and construction is very good and I will buy another when the time comes. This is an excellent slotted spatula. I use it strictly for fish and it actually works well with liver too. Its high quality and extremely durable. Well worth every penny and even more. I like this spatula better than the smaller wooden handle spatulas. It's heavier and stronger. I've seen a lot of the wooden handle spatulas bend and break. 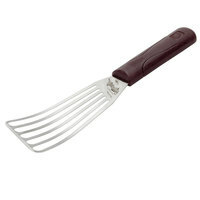 This spatula is great for eggs but is even better for delicate fish. This is a high quality product and I'm thinking of ordering one for my mother in law as well. Mercer bangs out good products, and this turner is no exception. definitely nice to have when pan cooking fish and other delicate objects. I would buy again if I needed to, but the quality of the product shows that I may not need to anytime soon. If you're looking for the perfect fish spatula, this is the one. It's thin and flexible, without being flimsy, and long enough to turn the largest filets without damaging them. This has become my go-to spatula. The slotted blade makes getting stick-prone ingredients out of the pan with minimal fuss. I wouldn't recommend using it on non-stick cookware, but it's great for just about everything else, especially the grill. The heat-resistant handle is a nice touch. Nice fish spatula. I bought this spatula as a replacement to a more expensive one that I had and I was not sure about it because of the much cheaper price but i was happily surprised at the quality. works just as well as the more expensive spatula. highly recommended. This just works great and is awesome for high heat areas. No burning and cool to the touch, and flexibility is just right. Not too rigid, not too flimsy. This is a great line of spatula I would recommend adding this one to any one's collection. The quality is very apparent and it will hold up to some heavy abuse. This spatula has multiple uses, which makes it worth the money. I like to use it to flip eggs on the pan. It gently lifts the eggs so that the yolk does not break. I love this spatula. Like the Mercer Genesis series cutlery, this Mercer M33183 6"x3" spatula is crafted with the same excellent attention to detail. The thin, flexible, trapezoidal, offset blade lets you glide underneath foods in tight spaces without squishing neighboring items. The rounded corners reduces the risk of puncturing the yolks and also makes it more acceptable (though still not ideal) to use on nonstick surfaces than straight-edged spatulas. The slots or the evenly-spaced fins allow draining of excess grease. The paddle is delicate enough for eggs and fish, while also sturdy enough for burger patties, cookies, cakes, and for scraping sauce from pans. There is no worry about melting the handle with the aptly-named Hell's Handle as it can withstand temperatures up to 450°F. The single piece design handle ensures durability and no accumulation of dirt, mold, or gunk. The texture provides a solid, yet comfortable, grip. Very pleased that I was able to scoop this up for a lot less than the price sold elsewhere. Not a lot of things are worse than making a perfect egg and then popping the yolk on the plating. This truner is delicate enouch for egss and fish. I use it for seafood and it works great with fish in particular. The price and quality is great. I am glad that I bought this tool for my kitchen. Now I love cooking my fish in skillet and in deep fried. Mercer M33183 Hell's Handle High Heat 6" x 3" Fish / Egg Turner / Spatula. This has become my go to spatula. I love the heft and feel in my hand. The material is high quality and the rounded corners keep my pans nicer. I've wanted to add one of these to my kitchen for quite some time and couldn't be more pleased with the Mercer Hell's Handle High Heat 6"x3" Fish/Egg Turner/Spatula. We used it for the first time the other night to turn scallops in the frypan. What a gem!!! Love the thin spatula. I can see it will be great for eggs and fish. Comfortable handle and great price too! We love these spats. They are a great buy as I have seen them almost double the price from other web sites and they hold up well. Great for Dover Sole fillets or basically any flat fish!! It makes those delicate items come out clean and gorgeous. Perfect for fried eggs too.! !